The Florida Theatre will host its annual summer party, Blues, Brews and BBQ, on August 23, from 5:30 to 7:30 p.m. Tickets are on sale now. The annual event, presented by Publix Supermarket Charities, pairs some of Jacksonville’s favorite local craft beers with some of our city’s best locally- owned BBQ restaurants. Throughout the evening, patrons can enjoy live continuous blues music by The Snacks Blues Band and Beale Street. VIP tickets are $100, and include early access at 4:30 p.m. to the Friends Lounge where ticketholders can sample unlimited BBQ and craft beer. VIP ticket holders can also enjoy a private cash bar and easy restroom access. General admission tickets are $50 and include BBQ and craft beer sampling from 5:30 to 7:30p.m. All ticket sales benefit the nonprofit Florida Theatre. Tickets can be purchased at floridatheatre.com. BBQ samples, sponsored by KPMG, will be located throughout the Theatre in both the main and mezzanine lobby areas. BBQ providers are Gilbert’s Social, Mojo Urban BBQ & Whiskey Kitchen No.4, Monroe’s Smokehouse, Wicked Barley Brewing Company, Atlantic Beach BBQ and BONO”s BBQ. Guests will enjoy unlimited craft beer provided by Wicked Barley Brewery, Bold City Brewery, Veterans United Brewery, 7 Bridges Grille & Brewery, Intuition Ale Works, and River City Brewing Company. Brown & Brown Insurance and CK Direct are this year’s brew sponsors. New this year, Nothing Bundt Cakes, will provide sweet treats for patrons to enjoy. 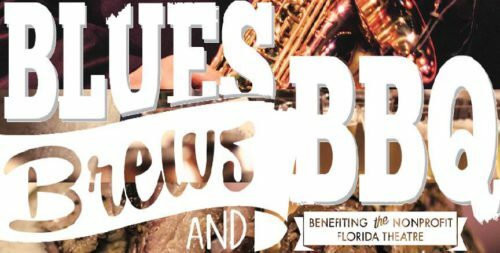 For more information and to purchase tickets to Blues, Brew and BBQ visit floridatheatre.com.